Definition at line 69 of file llpanelavatar.h. Definition at line 236 of file llpanelavatar.cpp. Definition at line 244 of file llpanelavatar.cpp. References LLPanel::draw(), LLView::getVisible(), and LLPanel::refresh(). Definition at line 78 of file llpanelavatar.h. 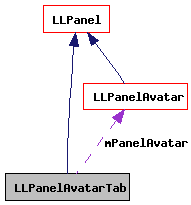 Referenced by LLPanelAvatarFirstLife::postBuild(), LLPanelAvatarSecondLife::postBuild(), LLPanelAvatarPicks::processAvatarPicksReply(), LLPanelAvatarPicks::refresh(), and LLPanelAvatarClassified::refresh(). Definition at line 81 of file llpanelavatar.h. Definition at line 254 of file llpanelavatar.cpp. References LLUUID::asString(), LLPanelAvatar::getAvatarID(), mDataRequested, mPanelAvatar, and send_generic_message(). 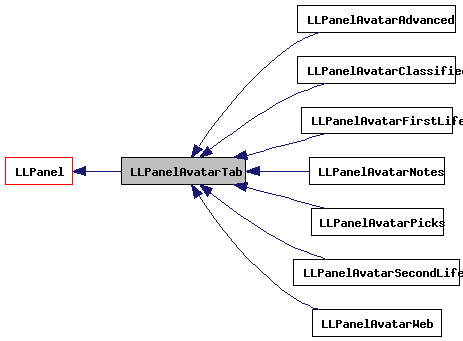 Referenced by LLPanelAvatarPicks::refresh(), LLPanelAvatarClassified::refresh(), and LLPanelAvatarNotes::refresh(). Definition at line 80 of file llpanelavatar.h. Definition at line 92 of file llpanelavatar.h. Referenced by isDataRequested(), sendAvatarProfileRequestIfNeeded(), and setDataRequested(). Definition at line 91 of file llpanelavatar.h. Referenced by getPanelAvatar(), and sendAvatarProfileRequestIfNeeded().